It is truly an honor to hold this position as Chair of the Subcommittee on Oversight of Minority and Women-Owned Business Enterprises (MWBEs). There has been a great deal of focus on this issue as interested parties seek to support the fair and equitable distribution of resources. As Chairperson, I plan to work with agencies throughout the state, MWBE stakeholders as well as Alphonso David, General Counsel to the Governor, to identify opportunities and explore ways to improve and build upon the MWBE procurement processes that are in place. I also plan to help expand outreach and help to find innovative ways to build the capacity and sustainability of MWBE contractors and sub-contractors that will create a robust competitive landscape. Later this year, in November, Assemblymember Crystal Peoples-Stokes, Chair of the Government Operations Committee along with my subcommittee, will be holding a series of hearings and roundtables about MWBEs. And, shortly, I myself will be embarking upon a tour both upstate and downstate so that I can learn first-hand what is happening all around the state. Rodneyse Bichotte is the Assemblymember and State Committee Woman / District Leader for New York State's 42nd Assembly District. Assembly Member Bichotte has been appointed Chair of the Oversight of Minority and Women-Owned Business Enterprises (MWBEs) Subcommittee. She currently serves on the following committees: Housing, Government Operations, Economic Development, Small Businesses, Banks, and Social Services. And was recently elected as the Vice Chair of the New York State Association of Black and Puerto Rican Legislators. In her first session, Assemblymember Bichotte has introduced over 24 pieces of legislation, four of which passed the Assembly -- one of which is waiting to be signed into law. In addition, the Assembly Member co-sponsored over 87 pieces of legislation. Under her leadership, collectively her and her assembly colleagues introduced over 40 pieces of MWBE and Small Business legislation. Assemblymember Bichotte continues to introduce and support bills around MWBE that will ultimately help increase participation, assist in capacity building and bring about a robust disparity study by providing recommendations around MWBE government procurement, and evaluate best practices and models on federal, state and city-wide levels. Assemblymember Bichotte's previous MWBE-related experience includes working with the Division of Financial and Economic Opportunity at New York City's Small Business Services (SBS), the Contracts Department at New York City Comptroller's office, and several other MWBE organizations and initiatives. 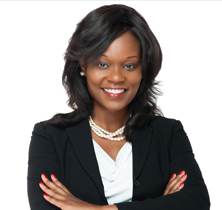 As Bichotte takes on her MWBE Tour throughout the state of New York, her mission around MWBE is to increase participation and sustainable growth opportunities in government contracting while understanding the dynamics from county to county. As a former Wall Street banker and corporate field engineer, she plans on leveraging her experience in the private sector to push public and private partnership initiatives across New York State. Bichotte is also a NYS and NYC certified MWBE s-mall business owner. She earned and holds an MBA from Northwestern University, Kellogg School of Management, an MS in Electrical Engineering from Illinois Institute of Technology, a BS in Electrical Engineering from SUNY Buffalo, a BS in Mathematics in Secondary Education from SUNY Buffalo State College.